If you have a large family (unless you are an accomplished minimalist) you have a lot of stuff in your house. Anytime you add more people to the equation, there is just more. More love, more fun, more dirt, more food, more laundry, more messes, more stuff! …piles and piles of dirty laundry and children running around nekkid! *Creative* meals made from pantry staples that no one really enjoys, and then when you make it to the store, you’re the weird one with four carts! It’s time to start thinking about decluttering in the same way as those other tasks that just must be done a little every day. It will take a little bit of time for you to start seeing and feeling results from decluttering this way. But remember, large family decluttering is a bit different from decluttering for the average-sized family! You have way more helpers! I’ve created a 30-Day Large Family Decluttering Challenge to help you get started building the habit of daily decluttering. I initially created this 30-day plan in an effort to prep for spring cleaning. But this challenge can be done anytime you need some extra encouragement towards decluttering. Start the 30-Day Decluttering Challenge! and build the habits to keep it that way! You have successfully started the 30 Day Challenge! One of the most important steps in your decluttering is getting the clutter out of your house. This seems so obvious, but unless you have a plan for dispersing your clutter, I guarantee you will end up with bags and bags of it either shoved into a corner of your closet, or piled in the back of your van. I have learned this lesson the hard way, one too many times. Have a daily plan for tossing the trash, and a weekly plan for a Goodwill run. I’m blessed that our Goodwill is on the right side of the road on the way to martial arts class, so it is so easy for me to make a weekly drop. If your donation drop isn’t in a convenient location, it’s a good idea to brainstorm some alternative drop locations. In my area there are a lot of drop locations located in parking lots around town. It’s basically just a cleaned out dumpster where you can put your bags of donations and then they come pick it up. It’s not 100% ideal because you won’t get a receipt for your efforts. But if a drop location dumpster will get the clutter out of your home, it is worth it! I am always tempted to try and first sell any of the clothes or household items that are still in good condition on Ebay or Craigslist. You may be able to successfully accomplish this. For me…it’s a trap. It takes forever for me to get something listed because I’m not highly motivated to do it. If I were trying to save up a big chunk of money really quickly, I could get it done, but otherwise, there is always something more important or more exciting for me to do. So listing items never gets done. If selling your items is a temptation for you, then give yourself a very strict time limit. For instance, make an agreement with yourself that if you haven’t listed your items in 7 days, they will immediately be dropped off for donation. And then stick to it! When your kids are involved in decluttering accomplishes two goals. 1. Your home gets decluttered exponentially faster. 2. Your children learn decluttering habits that will hopefully stick with them into adulthood. I keep decluttering as simple as possible when involving the children, and make my expectations clear. I assign a small number of items that I would like for each of them to get rid of from their room, usually 3-5 items. And then I ask the children to bring me the items. I always inspect what they want to get rid of first to prevent getting rid of something important. I will then put the items in the appropriate bag, trash or donation. So when I add up all of the children’s items, in addition to my own items, we can get rid of a lot of stuff without spending a lot of time. For me this works out to 3 items multiplied by 7 children ages 4 and over, plus my own 25 items. We just decluttered 46 items, and it happened in less than 10 minutes! Woohoo! 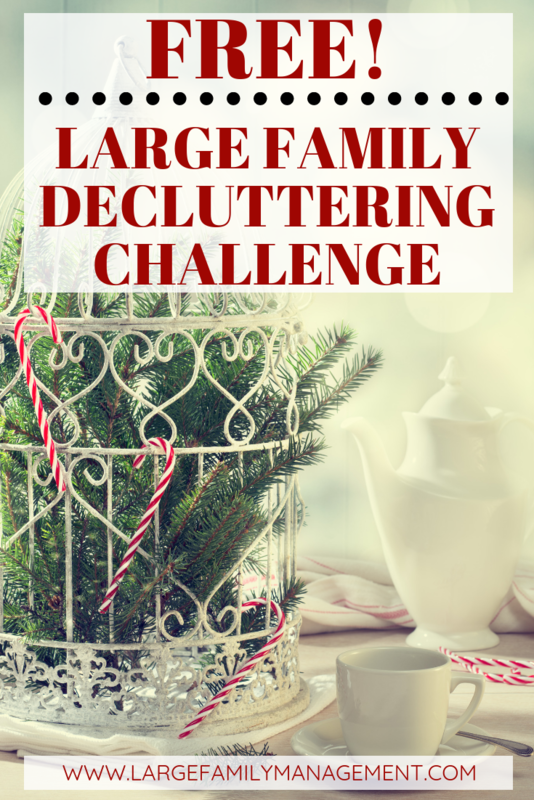 I’d love for you to join me for my 30 Day Large Family Decluttering Challenge! 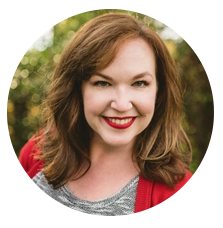 I will walk you through tasks that should only take you 5-10 minutes each day but will give you massive results over the course of the challenge. Alright!!! Let the getting-rid-of begin! I have a big pile to drop off tomorrow, but now I’m inspired to have each of the kids fork over 5 more items today! I confess to bursting out laughing at the comment on stuffing give-aways in the closet or back of the van. How did you know? Is someone spying on me??? Haha! Gotta MOVE ‘EM OUT! Looking forward to your declutter challenge! Thanks! Haha, Becky! I love it. We are all creatures of habit, right? Would love to join the challenge!! I may have 8 (soon to be only 7) fewer than 9 kids but I am always up for decluttering. Great post, let the challenge begin! You can also go to givebackbox.com to get a free shipping label, schedule a free pick up and get a donation receipt. Print out the label and UPS will pick up your box and deliver it to your local Goodwill. Once it’s received by Goodwill, you get a receipt in your email! It’s so much easier for me than trying to remember to stop at Goodwill (which is WAY out of my way)! Great tip, Janelle! I had not heard of that website! Hi there! I have signed up and received the emails, but I only received up to challenge day 21. I looked in my spam folders and nothing shows up. Are there 30 days of challenges? Thanks! Hi Rachel! There are a few technical details that I need to take care of to be compliant with new legislation (over in Europe! ), and until I do that, I need to wait to send anything else out. I will be resuming the challenge just as soon as I can take care of those details, and you will start receiving those emails again! Thanks for your patience! I am so guilty of thinking I need to try and sell the clothes, books and stuff when I declutter… and it almost never leaves the house! IUgh! Even though we only have 3 kids at home now, there is still so much stuff!